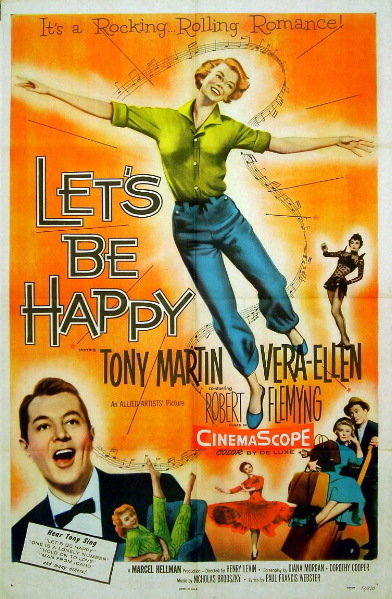 The other night I watched an old movie musical called Let's Be Happy. As musicals go, it's a B-movie all the way. Made in 1957 and starring Vera-Ellen and Tony Martin, it's lightweight, underwhelming, and the musical numbers are not exactly Rodgers and Hammerstein. Or even Parker and Stone. ﻿Still, I enjoyed the hell out of it, because I love cheesy old musicals of any stripe. But there was one scene in Let's Be Happy that I especially loved. Vera-Ellen, as the small-town girl who finds herself staying at the swankiest hotel in Edinburgh, does a dance number in her pajamas. Oh my gosh, look at those pajamas! I admit it, I'm a sucker for midcentury pajamas, whether they're babydoll nighties or adorable little two-peice sets like these. By the way, it's hard to tell from this clip, which is a little washed out, but in the movie, which was made in CinemaScope and Technicolor, every single thing in Vera-Ellen's hotel room is either lavender or lime green. Wow. Now, purple and green are my favorite colors. But this is sensory overload. In any event, her sweet jammies are the same lime green as the walls and the floor rug. It happens that I've been dying to start a new sewing project for a while now. The last thing I started was a summer dress (which was lime green stripes on white, now that I think about it), but I got interrupted in the middle of laying out the pattern pieces and I never got back to it. Earlier this week I helped Precocious Daughter, who is learning to crochet this summer, with some hand sewing on a darling clutch purse she made. It was a lot of fun and really got me thinking about what I could make next. Well, now I know. 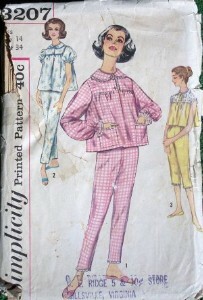 I've got a really cute vintage pattern for pajamas in my way-too-large collection. They're not exactly the same as Vera-Ellen's, but they're gosh-darn cute. I'm going to hunt for some nice lightweight fabric - maybe even a chiffon or a voile - and make myself some vintage pj's. this image that I stole off the Internet. I can't wait. I don't have any cute summer pajamas. When I go to bed I either throw on a T-shirt or, well, nothing. I want some sweet little old-fashioned jammies that I can curl up in. Or dance around in, if the spirit moves me. Maybe even in lime green. I'll update you on my progress. Wish me luck!